Caribbean reef shark, Carcharhinus perezi, belongs to the family Carcharhinidae. It has a robust, streamlined body typical of the requiem sharks, and is often mixed with dusky or the silky shark. Distinguishing characteristics include dusky-colored fins without prominent markings and a short free rear tip on the second dorsal fin. The snout is rather short, broad, and rounded, without prominent flaps of skin beside the nostrils. The eyes are large and circular, with nictitating membranes (protective third eyelids). There are 11–13 tooth rows in either half of both jaws. The teeth have broad bases, serrated edges, and narrow cusps; the front 2–4 teeth on each side are erect and the others increasingly oblique. 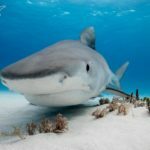 They are somewhat smaller than those of a Bull or a Tiger shark, measuring 2–2.5 m (6.5–8 ft) long; the maximum recorded length is 3 m (10 ft). They weigh about 70 kg (150 lb). Although they are very numerous in the Caribbean, extensive hunting has made an impact on their presence, and they currently have a status of ‘nearly threatened’ by the IUCN Red list of threatened species. It is valued for its meat, leather, liver oil, and fishmeal. Its liver oil is one of main ingredients in modern cosmetics. Caribbean reef sharks range throughout the tropical western Atlantic and Caribbean from North Carolina to Brazil and are the most common reef shark in the Caribbean. This shark species is most commonly found in water shallower than 30 m (98 ft), but has been known to dive to 400 m (1300 feet). It can be found swimming around the reef’s outer edges. 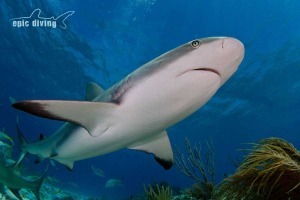 Especially in the Caribbean, their quantity is abundant and you can sure as a shark’s tooth count on meeting one. The Caribbean Reef Shark is known to be relatively passive and typically doesn’t pose much of a threat to scuba divers, snorkelers, swimmers, or other humans it comes into contact with. They are also known for their threat display, in which they swim in a short, jerky fashion with frequent changes in direction and repeated drops of the pectoral fins.